“Thick gain monster” sports three-way Aggression switch. 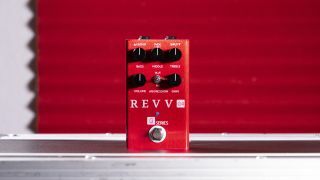 The G4 is an update to Revv’s G3 pedal, and is aimed at hard rock and metal players. The new unit offers higher gain tones in the form of a three-way “Aggression” switch—“Red” for all-out saturation & thickness, a tighter “Blue” option, and “Off” for classic tones, & dynamic blues breakup. There’s also a three-band EQ (bass, middle, treble), as well as volume and gain controls. The G4 is available for $229. For more information and to pre-order, head over to Revv Amplification.